Thank you, Mr President, and thank you, High Commissioner. I think this is clearly a topic that is moving very many members of the Council. So I also just wanted to pay tribute to you, High Commissioner, your staff and all your staff around the world. UNHCR probably see people at the worst point in their lives. And you do an incredible job in the face of increasing insecurity and increasing displacement, so please pass on our thanks. The United Kingdom is a very strong supporter of UNHCR, both in core funding and country funding, and we gave nearly $100 million last year. I was also very interested to hear what Anatolio said about the African Union interest in this subject and also desire to establish a humanitarian agency. And it’s very good to see humanitarian issues get so much prominence. 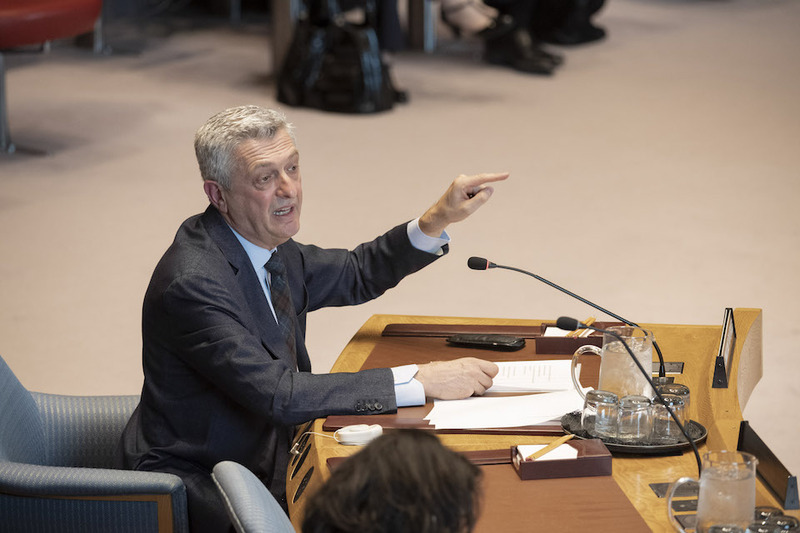 I think the principled role that UNHCR plays on returns is very much one that sets the international standard and the standard by which we should judge these major conflicts. And returns are part of a key durable solution and it’s important to remember that for the majority of refugees and host countries alike, it’s by some margin the preferred option. But as you said, it’s not always available and sometimes you end up with some rather pernicious trade-offs where refugees are encouraged to go back in circumstances very far short of safe, voluntary and dignified. So I think you’re right to challenge us to be more strategic. And I think if there’s any more you can say on that, High Commissioner that would be welcome. Looking at the individual countries that you mentioned, I think they just show that the reality is difficult. What you said about Libya I thought was worrying. I’m sorry the staff are under pressure. If there’s anything more you can tell us about what immediate steps would be helpful there, I think that would feed into the discussions we hope to have later this week on Libya. In Syria we don’t support returns where conditions don’t allow and we look to UNHCR to continue to set the standard of the three - safe, dignified, voluntary - principles. Looking at Myanmar, we have worked hard with UNHCR and UNDP to try and help create conditions. The 34 projects you mentioned are welcome but they’re not absolutely not enough. Is there any more you could say about how exactly we could help expand those projects from the Council and what exactly is the state of play on the MoU that you have with the Government? That said, you know we recognize the challenges of a situation like the Rohingya in Myanmar and Bangladesh. We’re not ideological about how the repatriation process occurs as long as international principles are upheld. And we’ll have a discussion tomorrow, Mr President, about Venezuela where the figures you were quoting, High Commissioner will be very relevant. And I look forward to hearing what Peru has to say on Colombia later in the week about the refugee burden. I wanted to turn to the Global Compact. I think from our perspective it’s a major opportunity to deliver longer-term solutions, looking at jobs, education, infrastructure and opportunities for livelihoods. But it’s got to be delivered, as we all know, in a way that supports those host communities and countries who are generous hosts. And the whole society of approach in the Global Compact I think has to be right and get the right mix of actors round the table and also, in doing that, allow UNHCR to concentrate on its core mandate. And we look forward to the first Global Refugee Forum in December and we’re ready to play our part. Lastly, I was struck by what you said about toxicity. I think this is something that this Council ought to return to. As we look at individual countries’ situations, we ought to remind everybody of the humanitarian principles in play.